With each new year, brings a new start for everything. 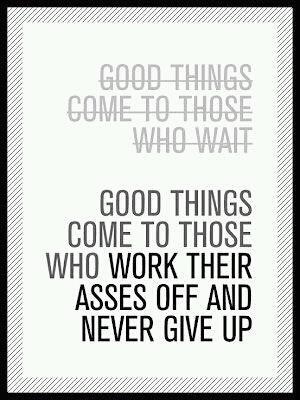 It’s the perfect opportunity to set new goals to work towards. I have many personal goals that I’ve set myself this year and my running will play a big part with achieving them! I’ve decided I’m going to start from scratch with my running PBs. Now that I’m into my fourth year of running, I thought it was time to clear the slate and set new goals to achieve PBs. 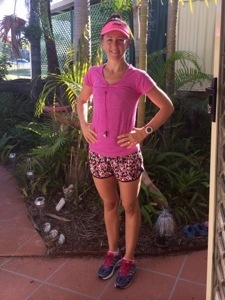 I have a new running log set up, new watch, new shoes, new items of clothing….I’m officially ready to take on my challenge for 2015!! *To run sub 5min kms for every km up until 12km. 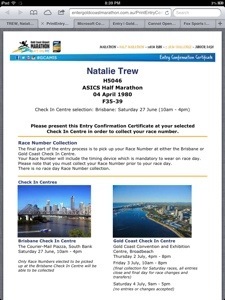 *And if my cardiologist supports me, run the Gold Coast half marathon in July!!! Thankfully I have a whole year to work on these goals lol! While we were overseas, I spent the month continuing to run but I didn’t track my kilometres. I would set myself a time frame and run for that. It was awesome. There was no pressure. But because of that, I have lost some of my speed, but that’s what makes this challenge even more challenging!! At the end of last year, I set myself a challenge to run 100k for the month of November. This is also another goal that I’ve set myself to continue to run – 100k each month this year. So far I’m pleased to say that I’ve just completed my biggest week of kilometres 33k, which has taken me to a total of 110k for the month of January, which is also the biggest month I’ve ever run!!! Now that I’ve started on the front foot and now that I’ve gotten over the most annoying sinus infection, I’m ready to face the challenge ahead of me!!! 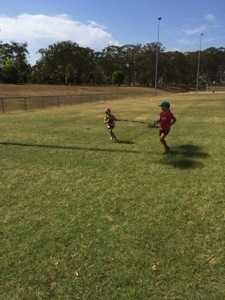 My final goal I’ve set for myself is to include the kids on one of my runs each week. So far last week Sienna rode 5k with me while I ran. We had a ball. She loved the first 4k but didn’t quite get my enthusiasm during the last kilometre lol! Mia waits for me each morning I run and we do a few laps of our street before we heading inside to stretch and this afternoon Bailey and I started training for his cross-country. I was so proud of him. He ran 2k in just over 12 mins and didn’t stop once! I’m so excited for what’s ahead! I hope 2015 brings us all good fortune with keeping fit and healthy and be sure that I will keep you up to date with how my progress is going! What goals or challenges have you set yourself for 2015? 100k November Challenge – Challenge Complete!!! A month ago I set myself a challenge to run 100k in the month of November. Not only have I successfully completed my challenge, I’ve run 101k to be exact! This week was my final week. I’ve been averaging 25k a week over 3-4 runs each week. I left my biggest challenge to last which was to run my longest run to date of 15k. It’s been another massive week which started with Mia waking at 4am on Monday!!! She then proceeded for the next three mornings in a row to wake between 4.30am and 4.45am, add in a ladies night out with my school mums, a massive week at work, taking the kids to specialist appointments and squeezing in a visit to see my grandad in hospital, to say I was tired by the end of the week is an understatement…oh and with only 6 more sleeps now until we board the plane for America, my mind is about to explode! But once again my running has kept my head above water. It’s my therapy to keep me sane. It allows me to gather my thoughts, plan things out in my head and it keeps me relaxed and focused…although my family probably don’t notice that at the moment lol! This weeks running consisted of two 5k runs – Tuesdays hill run was done in 25.05mins and Thursdays hill run was a naked run (no watch) but I checked the time on my iPod when I left and when I got back and I would have run that in about 26 minutes! I was happy with anything this week. My aim when I run is to just do that. I still hold a record of not stopping and now I’ve been running for 3 years, I have put pressure on myself to live up to those expectations every run! By Friday, my mind was consumed with getting ready to celebrate an early Christmas with my family on Saturday and completing my 15k run the next morning. Thankfully I had a good night sleep on Friday night and as soon as I woke at 5am on Saturday I set off on my run. The weather was perfect. No humidity, a nice light breeze, but the sun was shining. I had no expectations for the run other than not to stop until I was finished. I decided to run my 4k flat route three tImes and then three extra kilometres to make the 15k. I started off slower than I usually do. My first kilometre was 5.05mins and with each kilometre I became slower and slower. To be completely honest I wasn’t feeling it for the first 4k and when I saw 21.36mins I knew I had to pick up the pace. I finally picked up my pace and started to sit a lot more nicely into the run and when I reached 10k at 52.20 minutes, I was happy enough. As I approached the 12k mark, which was three times my 4k route, I told myself you can do one more lap…and I did!! I did it I really did it and it wasn’t a disaster, it wasn’t painful like I thought it would be, there were times where I couldn’t wait for it to be over, but for most of it, I was so determined to be successful. 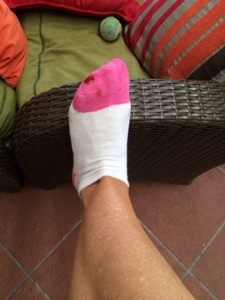 I am a competitor and I compete against myself, so when I set out to run 100k for the month I had to do one better…and that I did…even if I ended up with war wounds!!! 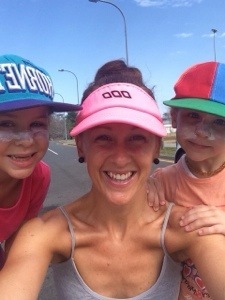 I was so excited when I got home, the kids always run to me to see how I went – they always ask “how many did you run today mum?”…my response “I did it!!! I ran 16k!!!! !” “Wow mum!! 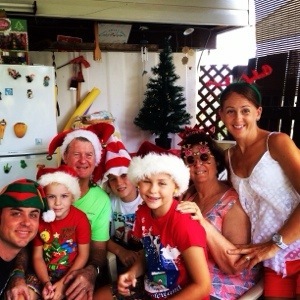 !” they replied with:) My excitement was short and quick as my mumma duties kicked back in quickly as we had Christmas celebrations to get ready for…and what a great day it was! If my cardiologist approves, I am going to start training for my first half marathon in March for July next year. I’m quietly confident he will let me. Now I know I can run 16k that’s only 5.1k off a half marathon so hopefully I’ll be able to pull one-off! 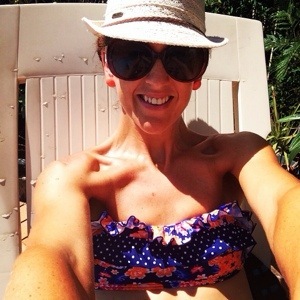 But for now, I will spend this week finishing off getting ready for our holiday we’ve been planning since we returned from our holiday to America 5 years ago!! 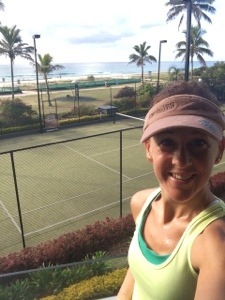 My goal is to run at every place we visit over there…I shall keep you posted! I hope everyone has had a great month challenging themselves to achieve new goals! 100k in November – week 3 progress! What a week! This week has been a normal busy one which started off ok, but slowly went downhill starting from when I got a call from the school to say Bay was in sick bay with an ear ache! 1 – I’ve only ever had one other call from the school in 4 years and that was from the school’s PE teacher, asking my permission for Bailey to be changed to Cunningham sports house, after he asked to be in the same house as his cousins (bless him) and 2 – I’ve never had a child go to sick bay! It’s been one of those weeks that consisted of unfortunate news for loved ones around…grandad developed an infection (but is finally on the mend) and my Aunty was diagnosed with an aggressive form of breast cancer (she now will fight the toughest battle of her life). This week in particular is always a week that leaves our hearts feeling heavy as it’s my cousins memorial day and my late aunty’s birthday – mother and son taken way too soon…may they be dancing in the heavens above with nana by their side! But all this aside, I kept my 100k challenge as my focus to not let the week get the better of me!! I started on Monday afternoon this week. After running my longest run ever of 13k two days previous, I thought this 5k run would sting. I purposely did a naked run (no watch) as I didn’t care how long it took, I just wanted to get it done and under my belt! Surprisingly I didn’t feel bad at all. And from the time I left and got back, I would say it would have taken me about 26mins and I was happy with that! 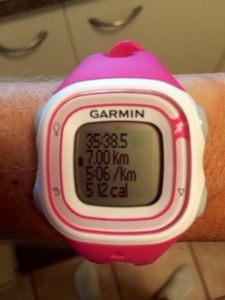 Two days later I got up early to run 7k before my husband went to work! My aim for this run was to go out hard and try to maintain 5 minute kilometres!! 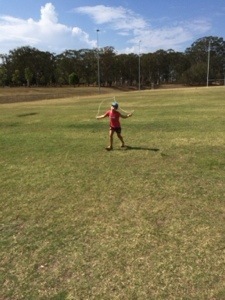 When I ran my first kilometre in 4.44mins I was feeling great! I was happy to reach 5k in 24.44mins and this gave me the confidence to achieve my goal. The next 2ks couldn’t have gone any better…6k 29.08 mins and OMG 7k 34 mins!!!!!!!! Two PBs in one run – definitely my best run in a while! I had planned to run the next day in the afternoon, but Kane didn’t get home until 5.45pm and I was simply tired! After being up with Bay in the night with his ear, I dragged myself out of bed Friday morning to run a quick short 3k. I would have loved a PB but after running a super 7k 2 days beforehand, I couldn’t expect too much. 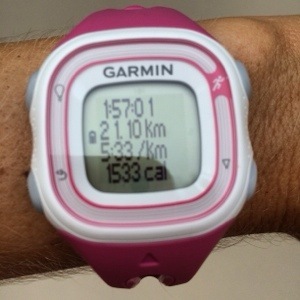 I was happy with 14.28mins…my PB is 13.53mins which I’ve run twice now – I will conquer this PB!!! I ran as fast as my legs would take me during this run and that’s what my plan was! Technically I always like to have a day off between runs, but I also like to finish my weekly running on a Saturday and because I didn’t run Thursday afternoon, this meant running 13k in 24 hours. This was also day 19 from when I started my challenge which meant 75k of running complete in 19 days!!! I’m not going to lie this 10k hill run which consisted of 6 hills hurt. When I reached my 1st kilometre at 5.15 mins I knew this would be a slow and painful run. But to my surprise I didn’t pick up the pace much but my legs started to ease nicely into the run….until the 8th kilometre. I swear my feet barely lifted from the ground during the 8th and 9th kilometre as my legs were spent! They were screaming at me and my mind was screaming back at them. I was so glad to be finished and in 54.09 minutes I was pretty happy considering! 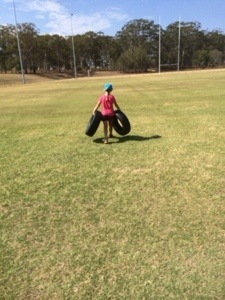 After my 10k was done I took the girls down to the footy field for a training session. 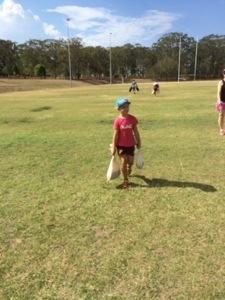 Over the last 8 weeks my dad has done a fitness program with Bailey, Sienna and my nephew Kaleb. Mia was always promised to go for the last one and sadly Bay missed out because he was laid up with his ear! They trained their little hearts out and it makes me so proud that my children love leading a fit and active lifestyle and I appreciate everything my dad does to help this! 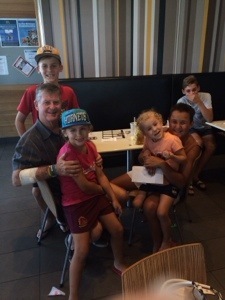 Poppy shouted the kids to lunch at Maccas as a treat for their awesome effort! 3 weeks down and 1 to go….or should I say 25k to go! This week will be my toughest challenge yet as I plan on running two 5k runs (easy) and a 15k run (not so easy) which will be my longest run to date….wish me luck I’m going to need it!!! I hit a brick wall this morning and felt so flat and tired but after a quiet morning, a swim at mum and dads this afternoon and hopefully a good night sleep tonight I’ll be ready to tackle another massive week as we are now down to only 2 weeks to go and I’ll be running in America!!! Would love to hear how everyone else is going with their challenges this month! 100k in November…week 2 progress! Please someone tell me where did this week go???? Mid November already and what feels like in a blink of an eye I’ve gotten to this point! 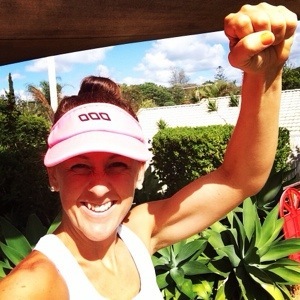 I’m so happy to report my week 2 November 100k running challenge to be very successful!!! After starting the week with terrible sinus (thank you dry allergy season weather) I didn’t let this steer me off track. My first run for the week was a 7k hill run that I ran in 36.50mins. I thought my legs would be murder after the first week, but surprisingly they felt great! I ran the first 5k in 25.37 and was hoping to run closer to 36mins but the last two hills in the last 2k slowed me down just a touch, all in all I was happy with this run! 13k, I have never run any further than 12k and have only done that twice on complete flat ground and it’s been a while since I did! But once I say I’m going to do something I do and I did!!!!! Due to the weather being so hot this weekend, as soon as my eyes opened at 4.50am I got up, got ready and was out by 5am! Thank goodness I did cause I was so hot by the end! I decided to run my 5k hill route twice and a 3k route that I use to run all the time when I first started running – in total this consisted of 5 hills…damn you Runcorn lol! I ran the first kilometre in just under 5 minutes and was happy with my pace until I told myself “my legs are bit sore”!!! Why why why?? Lesson to everyone never tell yourself that you are in pain always tell yourself you are feeling great!! This mental thought slowed me down a bit and although I was 20.38mins at 4k I felt my legs tiring with each kilometre…my legs were starting to buck at my challenge. But I didn’t let this defeat me. My goal was to reach 10k by 53mins where I’d placed a water bottle to take with me for the last 3ks. I made it to that point in 53.37mins, my eyes were right on the prize which was to reach 13k by 1 hour and 10mins!!! As I ran up the last hill in the 11th kilometre I kept telling myself “come on 3k this is easy!! 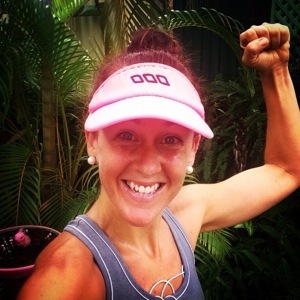 !” I started to convince myself that I wasn’t going to reach my goal but when I made 12k in 1hr and 5mins, I gave that last kilometre everything I had left. I was getting quite delirious though. At one point in the end I tripped and almost fell face down again (story for another day lol), rolled my ankle on a ditch and what I thought was a blue heeler dog running at me it was a shih tzu lol…like I said delirious!! It’s amazing where you find the energy to finish that last kilometre. I could feel my legs going faster and faster until they were at their peak. I gave it my all. I looked at my watch with 100m to go and had already clocked over 1hr 10mins, but only just. I finished in 1hr 10.50mins…I was stoked with that!!! 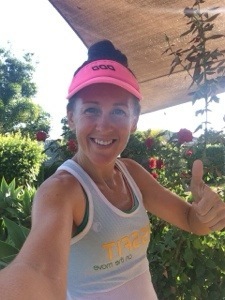 I proceeded to walk the last kilometre home which I always do a good walk to warm down after each run and I was on top of the world….running any distance is such a great accomplishment! 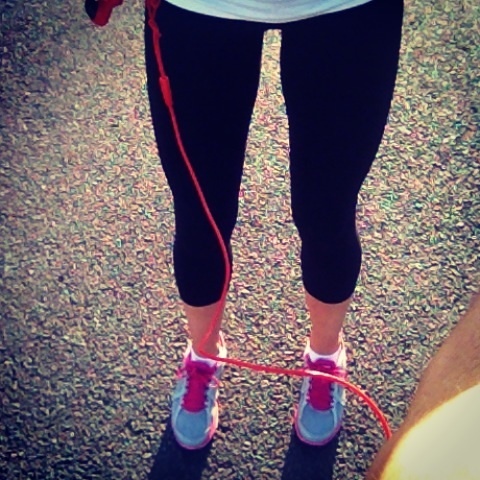 You ask…how are my legs today?? They are great! I thought for sure I’d feel it but surprisingly they don’t feel any different after any long run. I swam in mum and dad’s pool today and tread water for 25mins which felt so nice. No rest for the wicked though. I’ll be back at it tomorrow to start my 3rd week’s 25k. 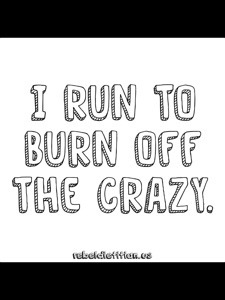 This week I will be doing 4 runs….5k, 7k, 3k, 10k! Wish me luck…I shall keep you posted!!! How is everyone going with their challenge for the month? It’s time! Time to set a challenge! Now that it’s November (I still can’t believe that) and only one month away from the festive season, I have set myself a challenge to run 100k this month! 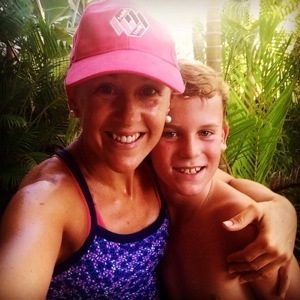 A month ago I wrote a blog 20/20, which was an insight into my school holiday challenge for myself – 20 days straight of exercise! Now that I’ve achieved that and made it to the other side of a massive but awesome October, I’m ready to push myself a little further than I normally run and instead of running an average of 18-20k a week, to successfully achieve this challenge I need to run an average of 25k a week! Today I started my challenge with a fast 5k of 24 minutes and felt fantastic!! My plan is to run either three 5k a week and a 10k or two 5ks a week a short distance of 2,3 or 4k and a long distance of 11 or 12k! I have not put any pressure on myself to run any major PBS this month but would love to increase my longest run to 15k. 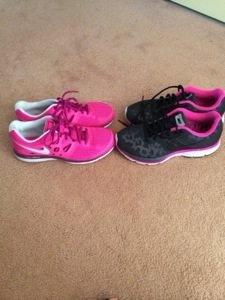 If you are a regular follower of my blog you would know the love I have for running and keeping fit and healthy. It’s been 3 years since I started on this journey and I’m so happy that one I started and two that I’m still going strong. But every now and again I like to mix things up and throw a challenge into my already crazy busy life – cause clearly I am crazy and not busy enough lol! So now I challenge you! I challenge you to choose some form of physical activity that you wish to challenge yourself with this month. Create a goal, make a plan and stick to it! I’d love to hear about it if you do!! 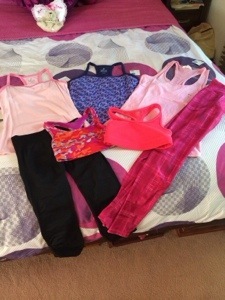 I shall keep you posted with how I go:) Happy exercising!!! Today marked 20 days straight of exercise! 20 days ago, I finished work for term 3 and started what would end up for me, because I work part-time, 20 days of holidays. I set myself a challenge that I would exercise every day of my 20 days off and I can happily say that I completed my challenge today…20/20 done! Over the past 20 days, I have run more than 50km, walked for hours, done a total of 40 minutes worth of planking, boxed for minutes on end and have done numerous amounts of squats, leg raises and lunges! And I’ve enjoyed ALMOST every second of it lol! Each day I would exercise for half an hour to an hour and in 24 hours that’s so simple to accomplish. My love of exercise and particularly my running, is not only assisting me in keeping fit, lean and healthy, it’s my therapy. It keeps me sane. 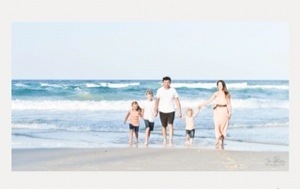 It helps me stay on top of the craziness that life brings when you’re a working mum of 3 kids under 8! It’s the only time I can focus on the thoughts in my head and where I spend a lot of time planning projects or daily chores. It’s my time where nothing else matters except for me! Most importantly it’s my energy….if I start my day with exercise I accomplish so much in my day – it makes me happy and I always feel fantastic after it! There were only a few times over the past 20 days where I had to force myself to complete my daily exercise but I did it! 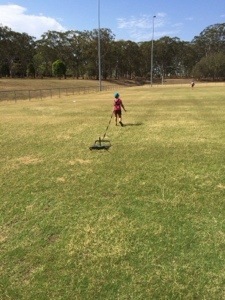 Because the kids have been on holidays as well, they enjoyed many days with me and would ride their bikes while I walked or would plank alongside me. It’s been enjoyable for everyone! I love my active lifestyle that I live. 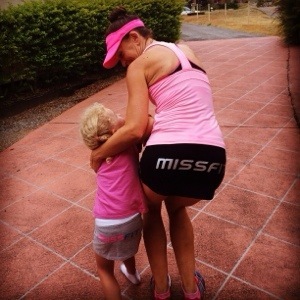 Between exercise and healthy eating, it’s not only giving myself the best chance of keeping my heart condition at bay, it’s leading a good pathway and setting a positive example for my very active children. I’ve been living this exact lifestyle for 3 years now and I haven’t yet steered off track. When I am feeling a bit flat or am in need of something to spice things up, I set myself a challenge like the one I’ve just completed. 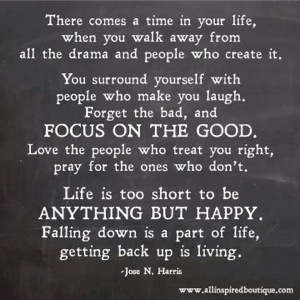 It allows me to regather and refocus on something new…like they say change is as good as a holiday! I shall keep you posted! Three years ago when I was diagnosed with a dilated aorta, it was the scariest time in my life, even more frightening than having a tumour removed from my thyroid (thankfully that turned out benign)! I remember thinking not my heart…that’s the organ that keeps you alive!!! Once we learnt more about it and my cardiologist, who is brilliant, educated us on what i was facing, although it took a while, I learnt to accept what I had without it doing my head in! Since then, I’ve had 4 echos and an MRI and for the first time since diagnosis my results have changed! Each time I trek up to the Mater Cardiology Department, all I wait to be told is that my aorta hasn’t grown from 4.5cm. Every time they always give me the nod of reassurance, but yesterday they didn’t! I walked away for the first time feeling very overwhelmed and sick with worry. I was told my cardiologist would contact me with the results…. I went straight home and emailed him. The next 12 hours would be the longest 12 hours I’ve ever lived! When I woke this morning, I frantically checked my email – nothing! I went about my business got the kids to school and before I set out to do my groceries, I checked my email and there it was….”your aorta has measured bigger than last year’s results, it’s now 4.6cm!” I went from feeling confident to fragile…. Although its only a mm of growth, it’s growth and that’s a big deal when in three years it hasn’t grown at all, this is the first time I’ve had to deal with growth! I always had it in my head that because I was probably born with this condition, maybe this is just how my heart is meant to be formed. Now that it has dilated further, the reality of this condition has bitten me today. I’m now only .4 of a cm away from being categorised in the severe range…..I’m not going to lie, this scares the crap out of me!!!! After some tears and lots of questioning myself – how’d I let this happen?? Oh and some retail therapy, I’ve picked myself up, dusted myself off and will continue about each day like I’ve done for the past three years. Because the realty of it is; I know I’m doing everything I can to keep myself as fit and healthy as I can. I don’t smoke or drink, I regularly exercise, eat well and all of this contributes to me maintaining not only good physical health but my mental health is the best it’s ever been! I’ve felt so good for so long and haven’t let this condition get the better of me, but today it got the better of me. I never feel sorry for myself but there were moments of today where I felt alone in this bubble. This was until I thought about the fact that there are so many people around me who are worse off. Tomorrow is a new day. I will start by waking feeling happy and appreciate what I have. I will continue to be in control of what I can be and leave it up to fate to control what I can’t . 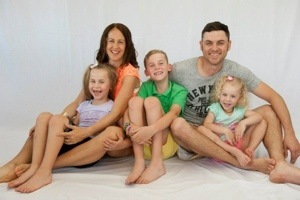 I will enjoy the small things in life that make me smile and laugh and most importantly I will continue to be the best mum and wife I can be to my party of 5. I will not let this little hurdle define or defeat me. I will continue to work hard each day in order for my heart not to deteriorate. 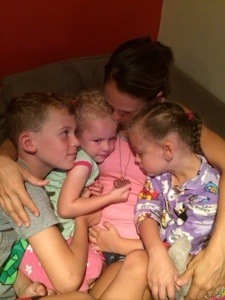 But for now, right at this moment, I will enjoy the best cuddles in town….from the 3 babies who have stolen my heart! This morning when I got up at 5.30 to go for my 5k run, I was mentally in a great place! I hadn’t run since my 10k last Thursday, I’d had a fairly relaxing weekend and I’d just woken from the best night sleep in a week. My legs were fresh. I told myself that this morning would be the day I run 5k under 24mins and that I did…..
As I left my driveway, I went out hard and fast. I kept telling myself to ignore any pain in my legs and to push through it. The first 500m seemed hard and hurtful, but I ignored it and pushed harder – as I approached my 1k mark I looked down and was surprisingly happy when I saw 4.35mins. When I have my mind set on a PB, I always aim to run the first kilometre around that time. I was feeling ok but felt at my maximum at this point. As I looked up at my 2k point I was hoping to reach a time of about 9.30mins so when I saw 9.20mins on my watch, it was received very graciously. By this time I kept telling myself once I get to 3k I only have 2k left and that’s easy. When I reached 3k in 14.06mins, I was starting to think that I’d reached my maximum and that the next kilometre, which is usually my slowest, was going to really let me down, but I kept pushing. I knew I must of been at my maximum because I was starting to feel that ‘I want to vomit’ feeling and when I saw 18.50mins at 4k I knew I had it in the bag. As I started my 5th kilometre, I had no pain anywhere throughout my body. I felt strong, I felt fit, I felt like I could have taken on the world! When I made my last turn down Warrigal road to run my last 500m I knew when I hit my 5k mark and stopped my watch it would show 23mins something….I was thrilled and over the moon when I saw 23.25mins!!!!!!!!!!!! I would have been happy to see 23.59 but 23.25….a fist pump and a shout out of relief was definitely appropriate for this point in time!!! I was pumped, shocked and excited all in one! I did it finally. After running 5k in 24mins several times in the last few months, I knew I would crack it eventually, all I had to do was wait for the perfect moment and back myself every step of the way! A run like this morning, signified to me how important our mental state is when trying to achieve anything. If I got up today with a negative attitude and no willingness to run hard, then I wouldn’t have come close to a PB, instead I smashed it by 40 seconds!!!!! If you want to achieve something, you will as I believe it’s ‘all in the mind’!